SAN MATEO, Calif. — Aug 2, 2018 — Snowflake Computing, the data warehouse built for the cloud, today announced the launch of Partner Connect, a new feature that enables Snowflake customers to get faster insights from their data. Partner Connect accelerates time-to-value through pre-built integrations with existing data integration (ETL and ELT) partners, including Fivetran, Alooma and Stitch. With rapid provisioning of these partner applications and automatic connection to Snowflake, customers can start loading data into Snowflake in minutes for immediate analysis. Partner Connect is currently available with Snowflake data integration partners Fivetran, Alooma and Stitch. 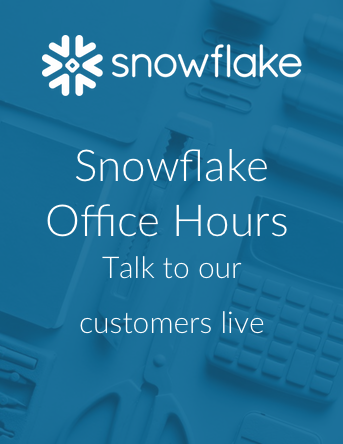 The feature is available to all Snowflake customers but specifically accelerates the onboarding of self-service customers who sign up online for Snowflake. Partner Connect makes it easy to create a free trial account with the chosen data integration partner and automatically configure the Snowflake connection. This enables customers to avoid the manual work associated with creating databases and warehouses, and separately provisioning and configuring a partner application. With Partner Connect, customers can get to their data immediately and accelerate time-to-insight. The program will continue to expand to include additional data integration partners and other partner types, such as business intelligence, advanced analytics (ML/AI), security and other technology solution providers. Strava is a website and mobile app for people to track their athletic activity via satellite navigation and then upload and share such activities. “Alooma, together with Snowflake, gives our marketing organization real-time data analytics pulled from across all app and ad sources without draining our internal engineering resources or sacrificing our security practices,” Strava Data Engineer, Carlin Eng said. Snowflake’s data integration partners already provide seamless integrations with Snowflake’s cloud-built data warehouse. Now, those integrations are available to organizations that become Snowflake customers by signing up via the Snowflake website. Customers of Snowflake and its data integration partners continue to experience greater efficiencies and faster time-to-value for their organizations. Snowflake’s Partner Connect is now available to all existing and prospective customers. To find out more, please click here. To sign up for a free Snowflake account, please click here. Snowflake is the only data warehouse built for the cloud, enabling the data-driven enterprise with instant elasticity, secure data sharing and per-second pricing. Snowflake combines the power of data warehousing, the flexibility of big data platforms and the elasticity of the cloud at a fraction of the cost of traditional solutions. Snowflake: Your data, no limits. Find out more at snowflake.net.